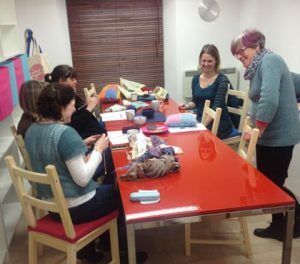 Here at Kathy’s Knits we run regular knitting classes in our purpose built classroom, both in the evenings and at weekends. You’ll find the details of all the knitting classes being run at Kathy’s Knits. Please note that places are limited and are allocated on a first come basis. To book onto any of the classes, use the button link below each class. All classes are full. New ones will be notified soon. Cathy Robb (‘Kathy’) is an enthustiastic yarnie with extensive experience of all things knitting. She has completed hundreds of projects over the years. From the most simple to complex she makes good use of her formal qualification in design, texture and colour. Kathy thoroughly enjoys sharing knowledge, and her desire to help fellow knitters develop new skills is as strong today as ever. Katherine Lymer is a knowledgeable knitter and successful workshop tutor who enjoys teaching a wide range of subjects to groups all over the country. She is an experienced teacher and, over the last few years, has done much of her work with Rowan, the internationally renowned hand knitting company. Kathy and Katherine are both active members of Ravelry, enjoy sharing ideas and views with fellow knitters and never stop learning themsleves. There are also other specialist tutors from time to time. Booking a place on any of our knitting classes is easy. Click here and simply complete the booking form, and, within 7 days, either pop into the shop with your payment or post us a cheque (payable to "Kathy's Knits"). You can also book in our shop or over the phone on 0131 556 4837.